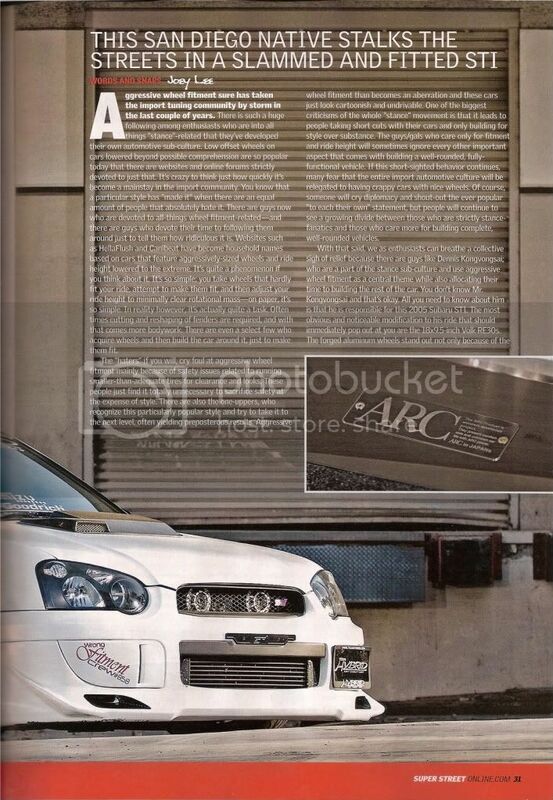 Congratulations to SD Chapter's Dennis Kongvongsai's 2005 Subaru Impreza WRX STi in a 4 page full feature in Super Street Magazine's October 2011 issue, pgs 030-033. 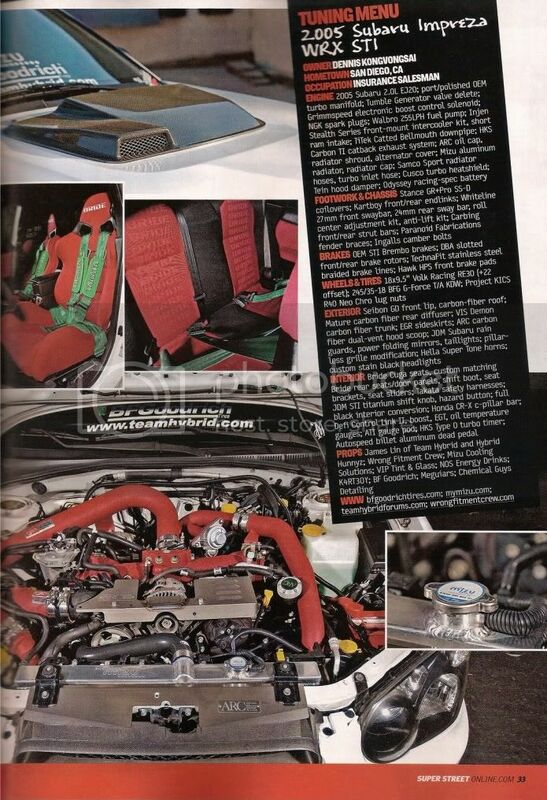 This makes it not only 2 months straight a Team Hybrid car has been in one of the major import magazines, but also, the second time this year, we made back to back months once again (goal is to make it 4 months straight in this last 4th qtr. of 2011). Lastly, even greater and incredible news is that this is the third time this year a Team Hybrid car has had a full feature article in Super Street Magazine which is still the #1 selling import magazine in the US. What import team out there today can claim these current accomplishments? Title of Article, "The State of Stance"
Super Street said, "Luckily for Dennis, he can switch up to another set of wheels if he chooses and always has a fresh set of BFGoodrich rubber, courtesy of his sponsorship through Team Hybrid." ps. Dennis, thanks for the luv as well as to the Hybrid Hunnyz in the props section. But even more thankful of the luv you give to our Team Tile Sponsors: Mizu Cooling Solutions, NOS Energy Drinks, BFGoodrich and Meguiar's. ps1. In this issue, there is also an article about "The TOP 15 Import Models of All Time! Who's Your Favorite?" Guess what, 4 out of the 15 are Hybrid Hunnyz (Jeri Lee, Maureen Chen, Lisa Kaye, KT-So) and 3 out of the 4 (Jeri Lee, Lisa Kaye, KT-So) were discovered by Team Hybrid first.